Polish poet; born in the village of Sluzewo (Sluzhew), government of Warsaw, Russian Poland, 1796; died March 25, 1869. He was sent in 1810 by his father to Berlin, where he prepared himself for a business career, at the same time manifesting an unusual talent for poetry. In 1816 he returned to Poland, where he established himself in business, but still found ample time to continue his studies and to write German verse. In 1861 he was elected member of the County Assembly, which, however, on account of the Polish insurrection, did not convene. 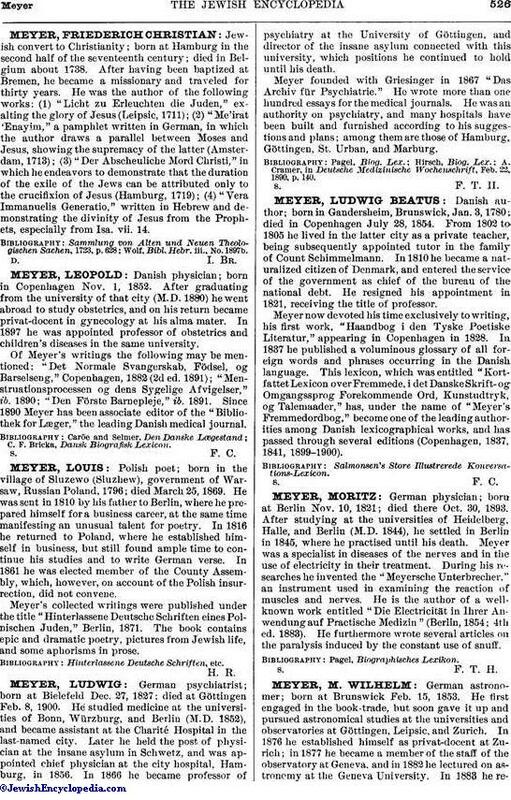 Meyer's collected writings were published under the title "Hinterlassene Deutsche Schriften eines Polnischen Juden," Berlin, 1871. The book contains epic and dramatic poetry, pictures from Jewish life, and some aphorisms in prose.